World Cup 2018: Too toxic for advertisers? For the past six months, a public art installation in the heart of Moscow has counted down the days, minutes and seconds until the start of the World Cup. The logos of corporate sponsors are displayed at the base of the installation, a reminder of the big money behind the tournament. A handful of global brands are represented, including McDonald's (MCD), Visa (V), Coca-Cola (CCE) and Budweiser (BUD). But there are also new, less familiar logos from Chinese companies: The property group Wanda, electronics maker Hisense, smartphone producer Vivo and Mengniu Dairy. According to media planning firm Zenith, Chinese brands will account for more than a third of the estimated $2.4 billion in additional global annual ad spend generated by the World Cup. That will mean plenty of ads from the new sponsors. 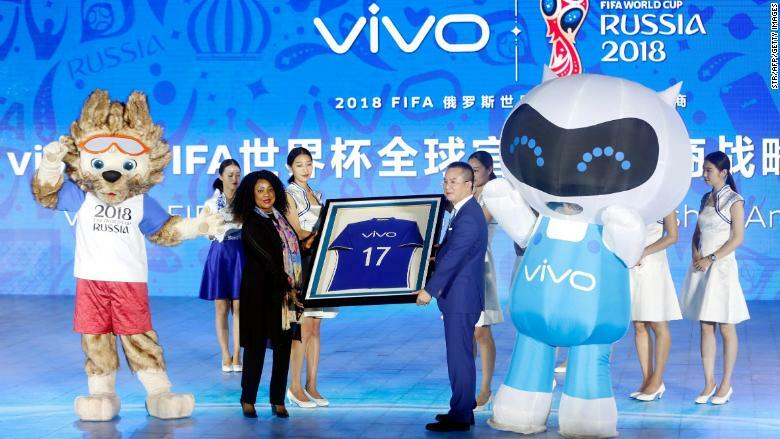 "While that might be in tune with Chinese consumers, I think it's out of kilter with what European consumers would typically expect to see during a major sporting event," said Simon Chadwick, a sports marketing professor at the University of Salford. The changing lineup of brands reflects major trends that have played out since the last edition of the world's biggest sporting event. There was an exodus of established FIFA sponsors following the 2015 corruption scandal that ensnared top FIFA officials. Brands are also worried about being too closely associated with host country Russia, which has been accused of meddling in US elections and is still under sanctions for invading and annexing Crimea in 2014. Market research company Nielsen estimated this week that FIFA took in $1.6 billion during the current four-year sponsorship cycle, a decline of 11% from the previous edition of the tournament held in Brazil. "You're getting less corporate interest," said Patrick McNally, a consultant who helped create FIFA's sponsorship model in the 1970s. "The top companies aren't [lining] up like they once did. They can't attract any big names." Experts and brand managers said that's mostly attributable to location. "Russia has been a big, big problem for a lot of sponsors and commercial partners because it's difficult to read the situation," said Chadwick, who ticked off a list of controversial issues involving Russia including LGBT rights, sports doping, Crimea and the Skripal poisonings. Major brands have proceeded cautiously. 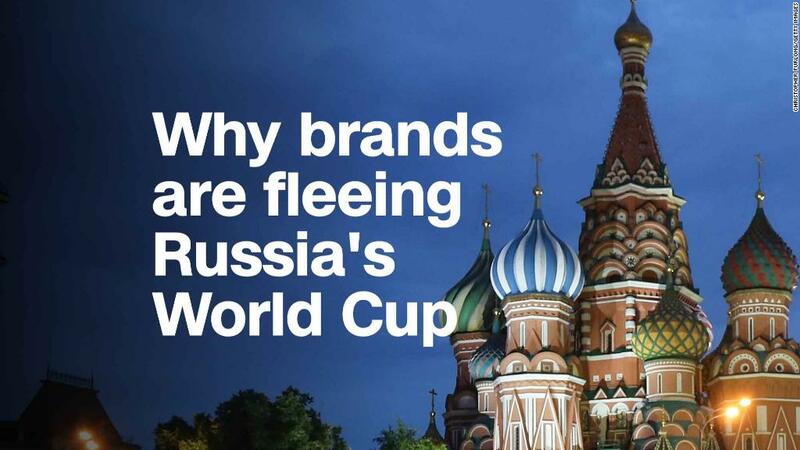 "What you haven't seen is them using any cultural references to Russia," said Steve Martin, the CEO of M&C Saatchi Sport and Entertainment, which has worked on Coca-Cola's World Cup ad campaigns since 2006. "It tends to be focused on the preparation for football and what's going to happen on the pitch," he said. CNN reached out to four western sponsors — Visa, McDonald's, Budweiser and Coca-Cola — to ask whether they planned to downplay Russia in their ad campaigns. "Our sponsorship is not an endorsement of any government or policy, but rather part of our aim to bring people together to celebrate life's greatest moments," Budweiser said. The others did not respond. FIFA hasn't signed a new western sponsor since 2011, contributing to the revenue crunch. Western companies may continue to stay away from the tournament in 2022 because of risks associated with host nation Qatar. It is involved in a tense diplomatic standoff with its Gulf neighbors, and human rights groups have criticized event organizers for not doing enough to protect construction workers from potentially fatal levels of heat and humidity. FIFA announced Wednesday that the 2026 World Cup would be jointly hosted by the United States, Canada and Mexico. "There's probably a long-term goal that eventually we're going to see a World Cup in China," said Martin.